Now today, there’s a piece at OneNewsNow which asks, without a hint of humor, “What about the rights of Christians in the military?”, as if they were somehow threatened. A former Navy chaplain has launched a petition drive aimed at defending military chaplains and Christian troops from persecution by proponents of homosexuality. Did you miss the part where gay soldiers already have to “learn to deal with” the fact that there are a few retrograde wingnuts who are upset about their “lifestyle choices”? Sounds like equal rights to me. 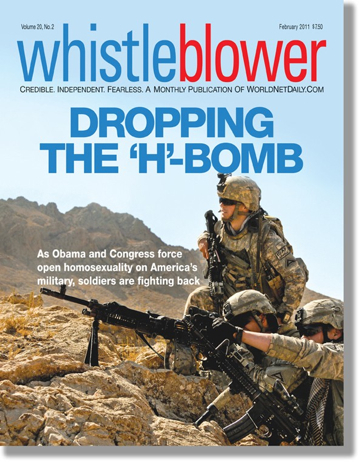 Of course, these little conservative children never seem to understand that gay soldiers “parading their lifestyle choices” amounts to little more than what their straight counterparts have been doing for years, e.g. mentioning the name of the spouse they left back at home, possibly displaying a picture of their spouse [being GAAAAY] just as prominently as the straight soldier who sleeps next to them. Maxey went on to write that he has a higher commitment to God than to the Department of Defense — and that if officials there are upset with his comments, they can “learn to deal with it.” Groups like the Military Religious Freedom Foundation have criticized the Air Force officer for his comments, demanding Maxey be punished for insubordination. You know, when they start talking about how they have a “higher commitment to [their idea of] God” than anything else, they sound just like Islamic radicals. And yes, that’s straight-up insubordination. [Klingenschmitt] has launched an online fax petition campaign aimed at protecting the religious expression of chaplains and other religious troops. “Now that homosexuals are coming out and being blatant and flaunting their homosexual lifestyle, do the Christian troops have a right to separate shower facilities? Separate sleeping quarters? To not be sexually harassed on the job by somebody who’s hitting on them?” he wonders. 3. Yes, because sexual harassment is already covered by the UCMJ, and DADT repeal does not change that. But let’s be honest here: any sane heterosexual human would be far more comfortable in a shower with a mature, responsible, openly gay person than they would with a leering closet case fundamentalist Christian, since we know that those with the most intense homophobia [religious-based or not; they use the religion as a shield] very often are those who are deepest in the closet, ashamed of who they are, what they feel, etc. And for the sake of equality, those soldiers aren’t being shuffled off to different shower facilities either. Of course, if they pull anything, they too fall under the UCMJ. They already have it. Always have, always will. This is why fundamentalist wingnuts are usually so easy to pick out; because they’re loud and obnoxious. In addition, Klingenschmitt is convinced the Pentagon wants to purge evangelical, Bible-preaching chaplains from the service by giving them an ultimatum — “reconcile” with homosexual sin, or quit. Yes, well, paranoia is a dangerous thing, but there’s medicine. UPDATE: It just gets funnier. Joe reports that Klingenschmitt has come up with a new way to charge each of his followers $159 to send faxes to all the members of Congress about how sad they are about DADT repeal.